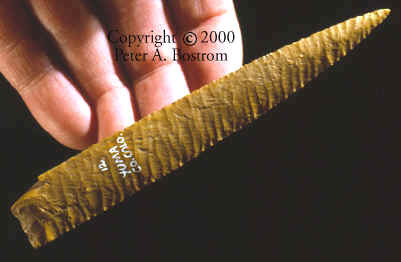 Many years ago this Angostura point was once the pride of the Anderson collection when the term "Yuma" was being used to describe different examples of early western point types. This term originated from Dr. E.B. Renaud of Denver University and is no longer used. Original names such as Oblique Yuma, Collateral Yuma or Yuma-Folsom have been replaced with specific names such as Angostura, Eden, Folsom, etc. Angostura points were named after the Angostura Reservoir near Hot Springs, South Dakota. 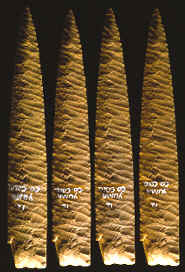 These early lanceolate spear points date to approximately 9,000 years ago. These points have bases that can range from concave to straight. Angostura points are most famous for the fine parallel oblique pressure flaking that some examples have. But they were also made with more random flaking. They have been found west of the Mississippi River in South Dakota, Wyoming, Nebraska, Colorado, Texas and Missouri. The point on the right in his picture is the original Angostura point. The other three points to the left are casts. This picture shows a triple exposure of the original Angostura point known as the "Anderson Yuma".